The NABRICO 10T, 20T, 40T and 60T Basic and Hydra-Electric winches offer you a choice of power, speed and control. Hydraulic power is provided by the vessel. The winch is self powered. The winch is remotely self powered. The proven holding capacity is certified by independent testing laboratory. 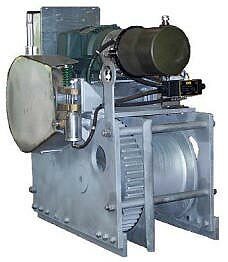 The free wheeling drum feature is standard on all 20, 40, and 60 ton winches to allow faster cable pullout. For more information on the complete line of winches and deck fittings produced by Nabrico please email or call us. Manufactured in 10, 20, 40 and 60 ton holding capacities. Pilot house and/or deck push button control. Self-contained electric-hydraulic package. Run electric wire to source. No piping required (for Hydra Electric winches). Automatic brake. Spring loaded, noiseless. Can be released for hand operation. Simple instant reversing by hydraulics. Standard C Face, 1750 RPM enclosed (T.E.F.C.) 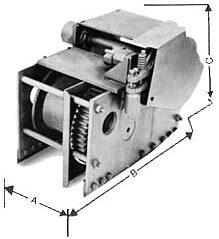 electric motor (except Basic winches). Machine cut gears for higher efficiency. Ball bearings on high speed shaft and large bronze bushings with grease fittings on all other shafts for long life and dependable service. Provisions for emergency operation by hand. Mechanical holding dog for emergency use. MODEL MOUNT S.T. LB. LB. LB. FPM IN. (1) Holding & Line pull ratings are for first layer of cable. (2)Wider drum widths are available on request. MODEL IN. IN. 7/16" 1/2" 5/8" 3/4" 7/8" 1" 1 1/8" 1 1/4" 1 1/2" HP LB. LB. These capacities are based on uniform cable winding. 10-6-HE 10-5/16" 1' 10-1/2" 3' 6-3/8"
20-7-HE 1' 3-1/2" 2' 6" 3' 5"
40-11-HE 1' 8-1/8" 3' 0" 3' 4"
60-11-HE 1' 11-1/8" 3' 10-7/8" 4' 3"
The amount of tension applied when spooling the cable will also affect the length.